I am looking for routes where the Air India flies the 787 and 747 since i heard they are being used for domestic routes, i would like to try my luck. I know a few for each, Frankfurt/London gets the 787, Dubai/Jeddah get the 747. I read How to find and compare flights carried out by a specific type of plane?. I would like to know all flights from Mumbai that use B787 and B747 (Even A380). Sadly, AI has lost one 747 in the Arabian Sea New Years' Eve crash. There is a complete timetable of all Air India flights at http://www.airindia.in/time-table.htm, and it has an option to filter by aircraft type (try B787 or B747). Google also turns up a PDF timetable with the same data at http://www.airindia.in/Images/pdf/TimeTable.pdf. From Mumbai, it shows one 747 flight, nonstop to Hyderabad and continuing to Jeddah; and 787 flights nonstop to Delhi, London and Singapore, with continuing service to various other places. Air India doesn't operate any A380 aircraft. Since the Boeing 787 & 747 are long-haul aircrafts, it is mainly used for international trips, esp. with high passenger numbers for profitability. 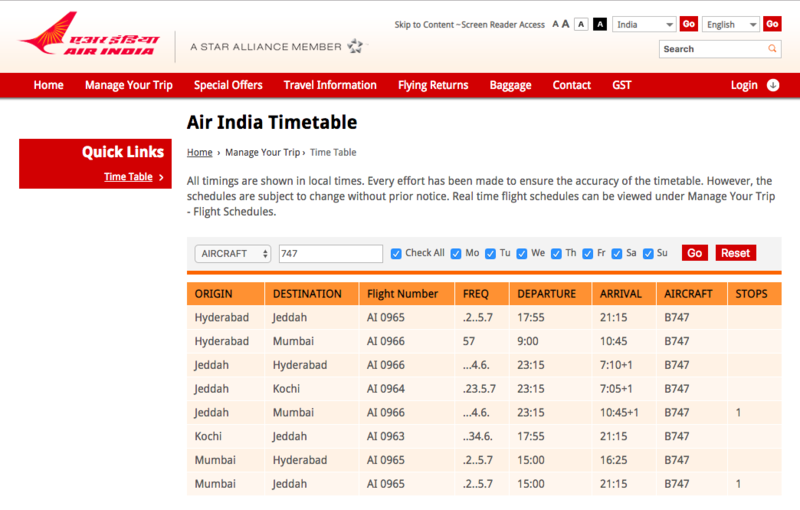 Update: Adding a screenshot from air india website (http://www.airindia.in/time-table.htm). Not the answer you're looking for? Browse other questions tagged air-travel routes aircraft flight-search-engines air-india or ask your own question. How to find and compare flights carried out by a specific type of plane? Boeing 787 Dreamliner Routes to Oceania? I am departing on an Air India flight from KTM before the Thai Airways lounge opens. Is there another lounge I can use? How to find past flight routes between 1977/82 Latin America and the former Soviet Union? Am I due any compensation for a 30-hour delay of an Air India flight?